KISSIMMEE, FLA. – May 31, 2017 – East Coast Defender unveiled “ProjectViper” today, its most capable SUV and the first made-to-order vehicle built by the company’s new Ultimate Vehicle Concept (UVC) division. The flagship $285,000,Chevrolet LS3 V-8 powered Defender was commissioned by a renowned doctor in 2016 and previewed by select media today at the Classic Car Club Manhattan in New York City. Only ten custom SUVs will be built on demand by the UVC division each year, making them the most exclusive custom SUVs available. Each UVC Defender is designed by the client and built in a separate production area at The Rover Dome in Kissimmee, Florida. East Coast Defender vehicles are designed to be capable drivers across a multitude of situations, including daily commutes. UVC vehicles will push the boundaries and be designed specifically for how the client will use the truck. Each UVC Defender will represent a no-budget, no-creative block that is built from scratch and represents a one-of-one Defender.The result will be a true, signature SUV that is purpose-built for the most extreme off-road and weather conditions, yet does not compromise ECD’s work on their other custom builds. 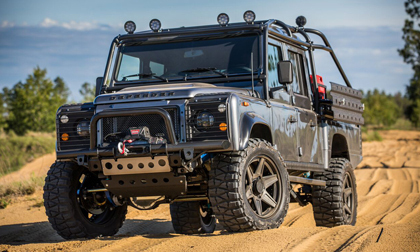 Located in Orlando, Florida, East Coast Defender is an award-winning builder of premium Land Rover Defenders. With over 25 years of Land Rover Defender building experience, ECDhas earned a reputation for its commitment to perfection, its dedication to build quality and its ability to maintain the heritage of the Defender while modernizing it for clients. East Coast Defender has grown tremendously and has expanded the term “luxury vehicle” to “all-terrain multi-functional luxury vehicle.” East Coast Defender currently has over 30 full-time employees in its 21,000 square-foot facility. For more information, please visit EastCoastDefender.com or call (407) 483-4825.